This guide help you become a Windows Insider, download Windows Server, and get Linux running on the Windows Subsystem for Linux. Windows Server 2016 (build 16215+). Right now, that means a Windows Insider's build. Download Windows Server 2016 - Insider Preview. Make sure you're logged in, images are only available to Windows Insiders. Now that you have a Windows Server image (.iso), install Windows Server on a physical computer or a virtual machine. 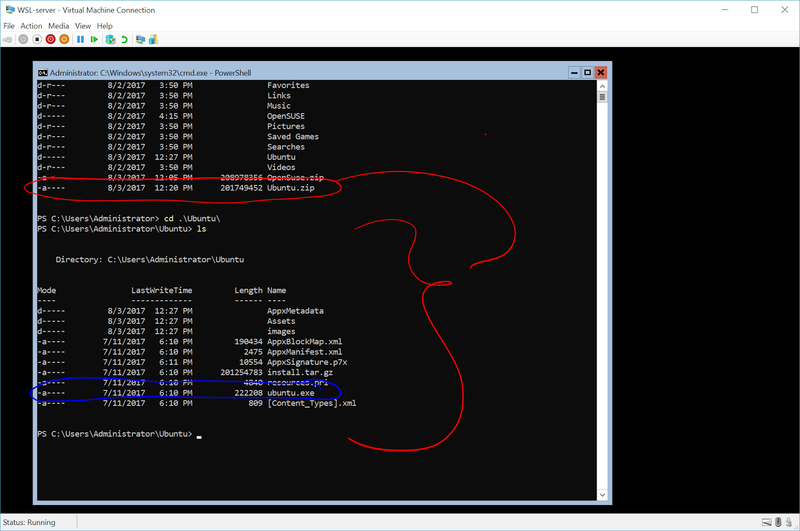 I'm going to use a virtual machine on Hyper-V.
During installation, Windows Server will ask for a product key. The following keys are available for unlimited activation of Windows Server (pre-release builds only). These keys may be used throughout the pre-release cycle. Read more here. Enable the "Windows Subsystem for Linux" optional feature and reboot. Download the appx for your favorite Linux distribution. 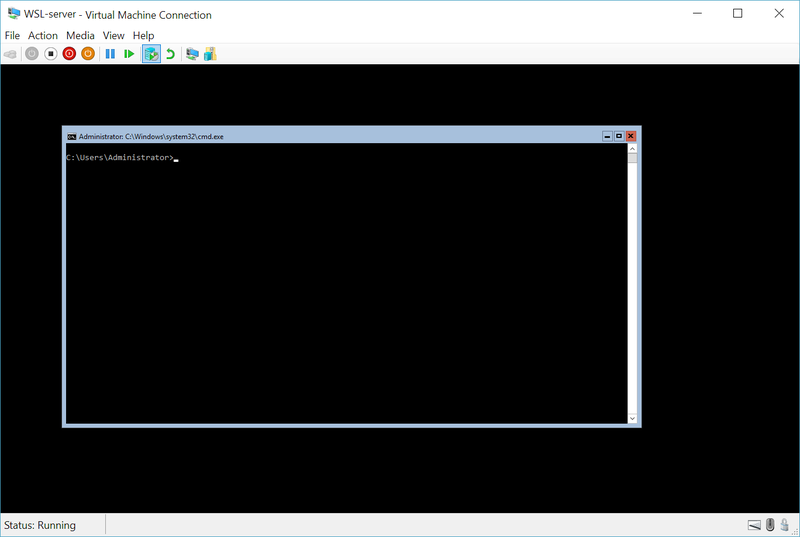 You can download the distributions to Windows Server with Invoke-WebRequest cmdlet. Here's a sample instruction to download OpenSUSE. Make sure your target directory (~/Ubuntu in this example) is on your system drive. Usually this is your C: drive. For example: ubuntu.exe, fedora.exe, etc. The Windows Subsystem for Linux optional component is enabled. Instructions here. The first time you install the Windows Subsystem for Linux, you will be prompted to create a UNIX username and password. This UNIX username and password can be different from, and has no relationship to, your Windows username and password. 5. Run distro's preferred update/upgrade. You're done! Go use your new Linux environment! 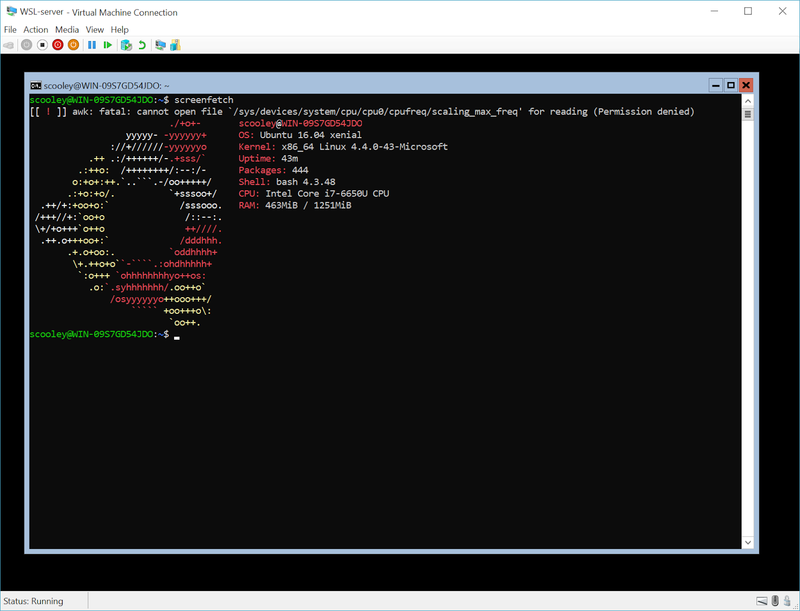 Starting in Windows 10 Anniversary Update, the Windows Subsystem for Linux can invoke native Windows binaries from the Linux console and Linux binaries from a Windows console. This interoperability functionality delivers a seamless experience between Windows and WSL. drwxrwxrwx 2 root root      0 Sep 28 08:45 .
drwxrwxrwx 2 root root      0 Sep 27 07:33 ..
C:\temp>dir | bash -c "grep foo"
C:\temp>bash -c "ls -la /proc/cpuinfo"
Modifying files located on VolFs (files not under /mnt/) with a Windows application is not supported. By default, WSL attempts to keep the working directory of the Windows binary as the current WSL directory, but will fall back on the instance creation directory if the working directory is on VolFs. Note that disabling interop will not persist between WSL sessions.